Vietnamese-style fruit salad with spicy salt is tasty and super easy to make. 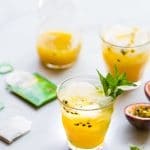 It has green/unripe mango, grapefruit and strawberry but please feel free to add other fruits you like. 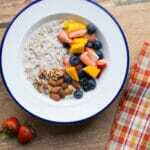 Adding salt to both ripe and unripe fruits is an amazing trick you should try if you haven’t. Salt enhances the natural flavors of the fruits, and cayenne pepper adds a spicy kick, which makes the salad much more interesting. – Plain: we just cut fresh fruits into slices or bite-sized pieces and eat straight away. Vietnamese families usually eat fruits like this after meals. 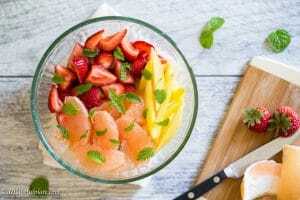 – Fruit cocktail with coconut milk, condensed milk and ice: bite-sized fruit pieces are mixed with crushed ice, coconut milk and condensed milk. It is highly popular with teenagers and young adults as a snack, especially in summer. 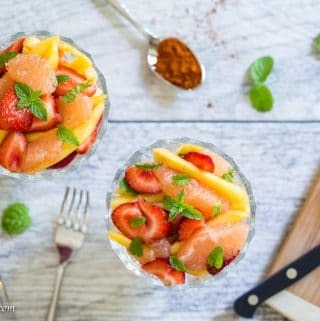 – Fruit salad with salt and cayenne pepper: this is also a popular snack among teens and young adults, and I will talk more about it today. Have you ever tried sprinkling salt over fruits and noticed that the fruits seem to taste sweeter, which sounds counterintuitive? Have you ever tried adding a pinch of salt to grapefruit and the grapefruit is much less bitter to your surprise? The simple explanation is salt is a great flavor enhancer and balancer. Salt neutralizes bitterness and acidity. As bitterness inhibits sweetness, salt helps to bring out sweetness while decreasing your ability to taste bitterness. Salt also makes tart fruits such as unripe mango taste more pleasant and sweeter. Overall, in this salad salt amplifies the natural flavors of the fruits and gives the dish more complex flavors. Why cayenne pepper then? The truth is I’m not sure about the science behind adding cayenne pepper. We are used to eating fruits with cayenne pepper and salt for years, and it just tastes so good that we probably… forget to question why. 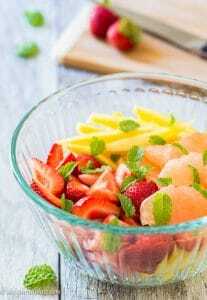 A pinch of cayenne pepper gives the fruit salad a nice kick, making things more exciting in your mouth. Salt goes well with all kinds of fruits, whether ripe or unripe, sweet, sour, bitter or bland. As for cayenne pepper, I think it pairs best with bitter and tart fruits. 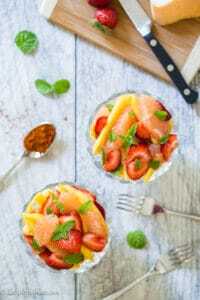 Please play around with this recipe using your favorite fruits to see what you like the most. 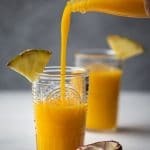 I also want to talk a little bit about mango in this recipe. You should use green/unripe mangoes which are still firm. They are easier to handle, and more importantly, they give the dish the slight tartness and crunch it needs. Unripe mango, salt and cayenne pepper is a classic combination in Vietnam. 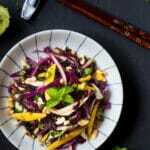 We also use green mango in savory dishes, such as in this Chicken cabbage mango salad. For this recipe, you will also need to section grapefruit. The easiest way to do it is to use a sharp kitchen utility knife or paring knife, cut off both ends of the grapefruit, use the knife to peel and then section it. Wikihow has great instructions and photos/clips demonstrating how to do it here (please see method 1, and I usually don’t do step 3). Prep all the fruits: peel and cut mango into thin matchsticks, peel and section grapefruit, quarter strawberries. Place everything in a clean mixing bowl. Add mint leaves, lemon juice, salt and cayenne pepper and gently mix to combine everything. Adjust amount of lemon juice and spices to your liking. It's best to add half of the cayenne pepper and then taste to see if you want to add more. This idea is so brilliant!